These translucent round badge reels come in a great array of colors: Blue, Red, Clear, Purple, Green and Orange. The badge reels are rated for a hefty 100,000 pulls. Coming with a clear vinyl strap and swivel spring clip. The reel diameter measures 1-1/4" (32mm). Cord length 34" (864mm). This is a pack of 25 long lasting, high quality, sleek badge reels. Order yours today! These translucent round badge reels come in your choice of blue, red, clear, purple, green, or orange! 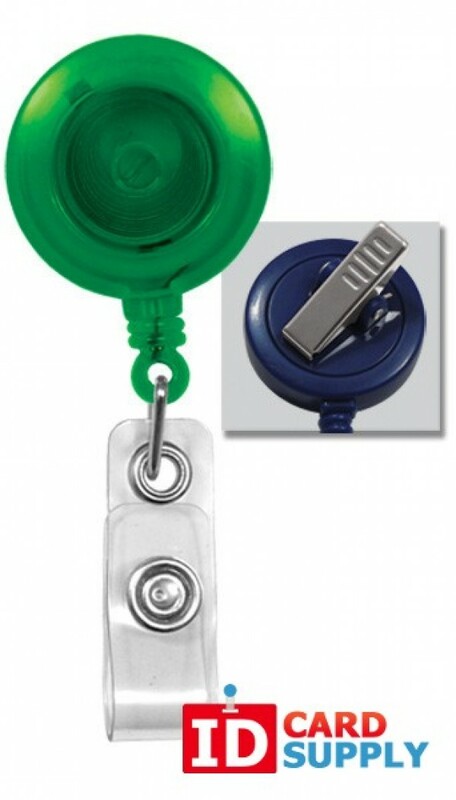 The badge reels are rated for a hefty 100,000 pulls, and come with a clear vinyl strap and swivel spring clip. The reel diameter measures 1-1/4" (32mm), and the cord length is 34" (864mm). This is a pack of 25 long lasting, high quality, sleek badge reels. Order yours today!